Jewelry post today, i am not a big fan of jewelry as i tend to lose them all the time (yes it's true). I haven't found a storage yet for jewelry so in my case i only buy things i will wear constantly, saving me from them going walk - a - bouts. 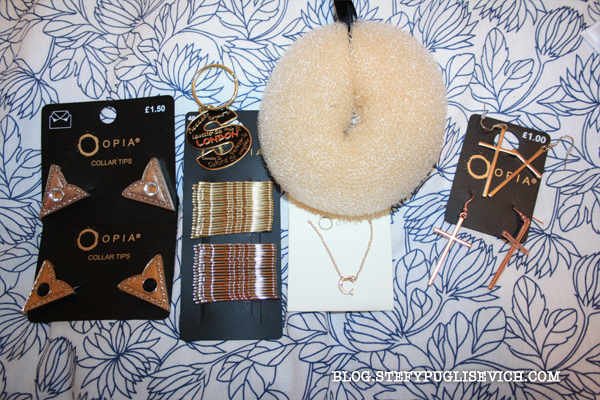 I must admit i didn't really need any jewelry as i find my rose gold watch just does it with my new earrings that my boyfriend got me for christmas, but whilst i was lurking around in primark i said i'll just pick up some little things. First thing that caught my eye were these Collar Clips, the fact that there was gold and silver i just couldn't leave without them both. Hair Grips yes in silver and gold, since i'm blonde my sister had purchased these awhile back and said how they blended in well with blonde hair rather then the other coloured grips and she was right! The cross earrings, these have been all over other blogs and i just wanted all three colours but had to leave the silver behind as i don't normally wear any silver jewelry so it would have been a waste so i picked up gold and rose gold. Lastly i picked up a larger hair donut for my hair as i love these and also a initial necklace i couldn't find "S" but i managed to find "C" that is for my boyfriend and it's in gold so i can't complain as it's tiny and simple. LAST but definitely not least, i picked up a new keychain from those london clearance shops on oxford street. A simple gold and black initial keychain with famous places around London written on it. p.s love the collar clips!